In May of 2007, immediately after graduating from high school, Peter A. Rodriguez received a scholarship to play baseball at Nova Southeastern University, where he was a starting pitcher for three years. Mr. Rodriguez graduated from Nova Southeastern University in May of 2011 with a Major in Business Administration and a Minor in Sports Management. 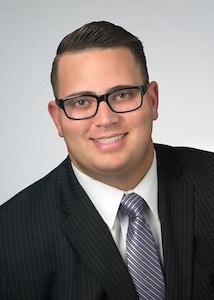 Upon earning his undergraduate degrees, Mr. Rodriguez attended law school at Nova Southeastern University Shepard Broad College of Law, and graduated in December of 2014 with a Juris Doctor Degree. While in law school, Mr. Rodriguez made the Dean’s List twice and was the Bronze Award Recipient in Shepard Broad Law Center’s Pro Bono Honor Program. Mr. Rodriguez has experience in family law, civil litigation, entertainment law and employment law. Mr. Rodriguez interned at Miami-Dade Legal Aid, where he primarily worked on cases involving family law and entertainment law, and also served as a judicial intern for General Magistrate Carlos Fernandez at the Eleventh Judicial Circuit, Family Division. Mr. Rodriguez joined Richard A. Schurr, P.A. in February 2016.